The Guide - What does it do? We all lead busy lives and managing your social media channels is a good way to use up what little time we have. There is no doubt that one of the most powerful social networks at the moment is Twitter. At the time of writing there are over 500 million users and more and more businesses and brands are joining every hour of every day. That's a lot of users! With so many users and so much noise, how do you make sense of it all? Who should you follow? Who is important or relevant to you? Who influences you? How do you make helpful contacts? How do you reach out to potential clients or customers? On its own, Twitter lacks many helpful features- and this is where a social media tool comes in handy- or to be more specific, a CRM (Customer Relationship Management) tool. Social networks are hugely powerful, but by themselves they are a very blunt tool. You could monitor what people are saying about your business or brand? You could see who is linking to your website from tweets? You could discover new leads and people likely to engage with you and your brand/business? You could find out who your core community members are on Twitter and engage with them better? You could unfollow irrelevant Twitter followers who have no intention on engaging with you? You could find out who has followed or unfollowed you recently? You could segment your followers into groups to facilitate managing your community in a more powerful and useful way than Twitter lists allow? 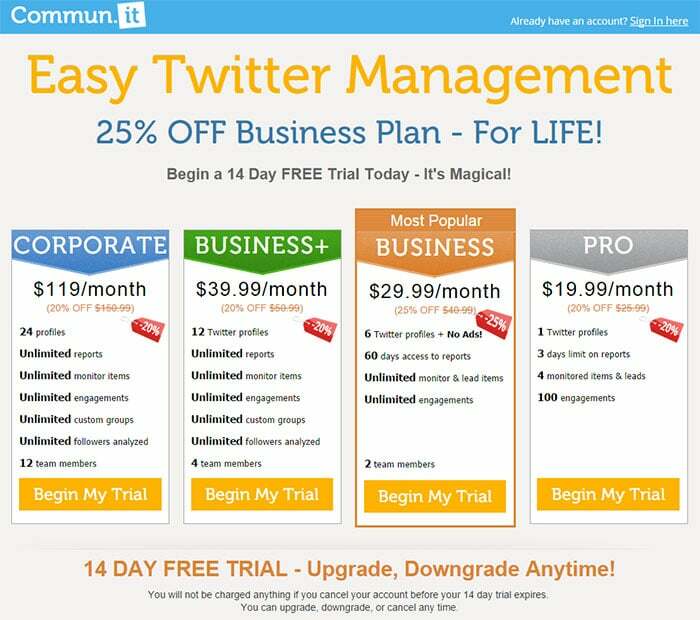 You could manage multiple Twitter accounts easily in one place? You could receive reports on how your community is doing? If you've spent any time on Twitter, you will be aware of several Twitter tools. In fact I've lost count of the Twitter tools I have seen over the years. So as not to waste your time, I'll cut to the chase and recommend one that will definitely make your social life a lot easier. It's called Commun.it* which has just come out of private beta and is a start up based in Tel Aviv, Israel. As you can probably guess from the name, it's all about helping to build and manage your Twitter community and making sense of it all. I was privileged to sign up not long after it was launched in private beta in 2011. It's now open to all and has some big brands on their books including Cisco, Sony, hp, Dell and Nike. I admit, that at first I was a little puzzled as to what Commun.it was supposed to do, but suddenly it clicked and I realised how helpful it could be. Since then, the guys at Commun.it have worked hard to improve the interface and the inner workings of it, and have been very quick to implement new ideas. The fact that they are all really lovely people who are passionate about what they do is a very welcome change to previous experiences I've had with IT-related companies. All 3 founders (Mike Polischuk, Sharel Omer & Ran Margaliot) are from Israel, which is where some of the team from the fantastic scheduling tool, Buffer App are currently based. It's all about relationships- making it easier to engage with your community, finding new leads and build and nurture your business community through a social dashboard. Social media is all about relationships (or at least it should be!) and social networks can be used powerfully to maintain and build business relationships as well as help to communicate the brand and message of your business. “Social media has become instrumental in maintaining all kinds of business relationships: with customers, prospects, partners and more. Yet, so far tools to support this kind of relationship building and management have been sorely missing. Commun.it facilitates the management of relationships on Twitter (and the hope for the future is other networks) in a similar way that MailChimp and SalesForce work in other types of online media. I've given a brief intro to Commun.it, and I will go into more detail later, but one of the co-founders of Commun.it, Mike Polischuk, was very kind to answer some questions for this article. What better way to find out about Commun.it than one of the co-founders?! Ian: Hi! Can you introduce yourselves, where you are from and what you like to do for fun? Mike: I am Mike Polischuk, Commun.it co-founder. 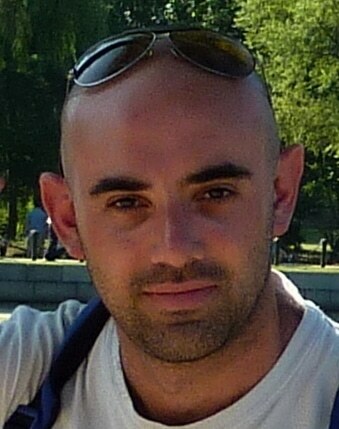 I'm 31, recently married, from Haifa (that's north of Israel). Aside from dealing with the product and the technological side of Commun.it, I love good movies (Woody Allen, Ingmar Bergman, Wes Anderson) and occasionaly write in my blog. Ian: Can you describe Commun.it in less than 140 characters? Mike: Commun.it helps businesses & individuals to focus on relationships with the highest ROI by analyzing their community. Ian: How would you describe Commun.it to the average internet user? 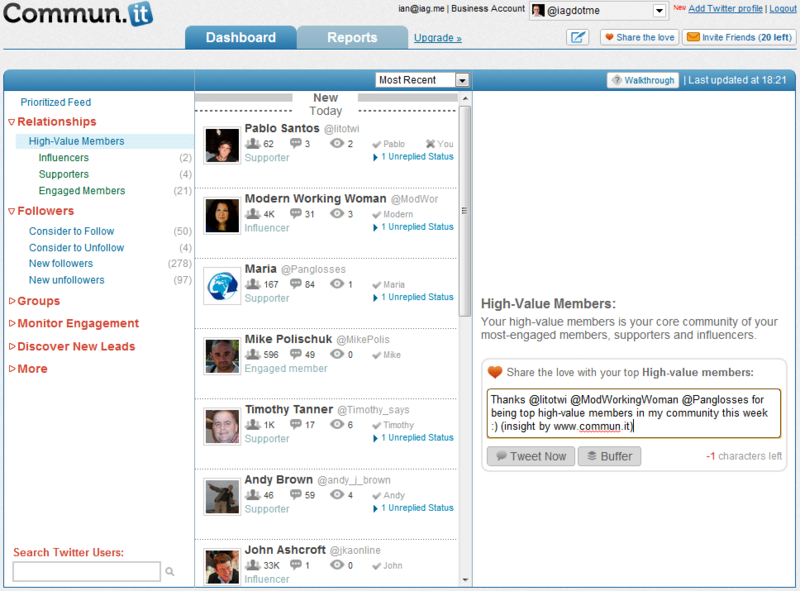 Mike: Commun.it is the Priority Inbox for your relationships on Twitter. It sorts the important ones from all the others, helping you focus on those that matter, and reducing the stress. 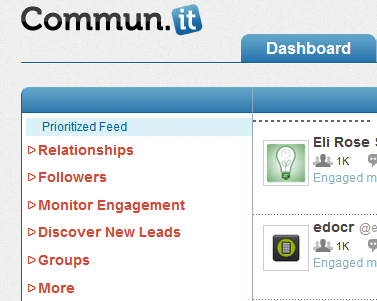 Ian: With so many apps out there, why should a business owner or marketing department use Commun.it? Mike: Commun.it is the first solution that fuses community management, CRM and lead generation in a way that enables business-focused relationship management on Twitter. Social Media Examiner calls us #1 Relationship Management service. Ian: Can you tell me a little bit more about the team behind commun.it, where you are all from/based and what made you come up with the idea? Mike: The team is Sharel, Ran & Mike - we are all from Israel, and this is our first startup. The story goes back to our desire to help bloggers manage their community... but we soon realized that the challenges that bloggers are facing, occurs to any business with online presence - so we needed to think bigger - and this is how we became Commun.it. Ian: What's the tech scene like in Israel? Can you tell us about what it's like working there? How many other tech businesses are there? Ian: How did you come up with the name? Mike: Community management is the soul of social media marketing, and the name reflects our commitment to make community management a pleasure, not a drag. Ian: How has it been? Have you been pleased with the take up? What's been encouraging and what has been discouraging? Ian: Can anyone sign up for commun.it? Mike: Yes, you can sign-up to Commun.it, it's free and really easy to start using. Ian: Can you tell me a little more about the technology behind Commun.it? Hosting, PHP/ASP/Ruby etc. Server location or do you use content delivery networks? Mike: Glad you asked 🙂 We are writing the application using Ruby on Rails, the DB is MySQL and we are using dedicated hosting servers in the U.S. We currently don't use CDN's. Ian: What are your plans for the future? Mike: We intend to add more social channels, and allow collaboration of team members. Ian: Apart from Commun.it, what other Twitter and social media tools do you use, love and recommend? Mike: Did we mention Buffer? We love it, use it every day, and integrated with them just recently. Ian: Will Commun.it always be for Twitter? How about other social networks? Ian: How do you feel about Twitter's recent API changes? Mike: We are watching closely the recent changes, and from our understanding they are currently not affecting us, since we are not in the dangerous "consumer-engagement" quarter. I'd like to thank Mike for taking his time to respond to my questions. The Guide - What does Commun.it Do? It's all about focus. With so many Twitter followers to engage with, how do you find who is relevant to you? Commun.it has developed their own algorithms to scan your followers to work out this relevance. The Relationships category presents you with the followers that influence you or you engage with. These are the followers that either relate to you or you relate to them or both. You may have an idea of who these people are in your head, or perhaps you have been tech-savvy enough to have put these followers in a "relationship" Twitter list. The great thing about Commun.it, is that it is dynamic and works out your influencers and engaged followers based on the data. Not only that, you can respond and engage with them straight through the dashboard! High-Value Members. This shows the core members of your community. It contains people you engage with, people who support and promote you as well as the people who influence you. Influencers. Commun.it gives you a list of the top influencers in your community- the people who influence you and other members of your community. It does this by working out how often you have engaged with them as well as the ratio of their followers to people following them. Supporters. Commun.it describes supporters as helping you "spread the word by retweeting your statuses and sharing links to your content." Commun.it is a great way to thank and encourage your supporters for all their timeless work! Engaged Members. These members (funnily enough!) engage with you the most. Commun.it analyses how many mentions, retweets, direct messages and favourites as well as other data. You can engage with all these members straight through the dashboard. Commun.it lets you know if one of the members has mentioned you and you haven't responded- so you can reply to any left over conversations. I don't know about you- but this is such a useful service- and one that makes me come back to commun.it several times a day! You can even add the reply to your Buffer (if you use the Buffer App) so that the reply will be scheduled later- at a time when your followers are more likely to be using Twitter. Another great feature (although one that you shouldn't overuse) is that Commun.it can let you thank and encourage members in each category by sending a tweet to a selection of them. Probably your first port of call, is the "prioritized feed" which shows you the most important tasks for you to act upon. This is a combination of all the other sections and is probably a good place to start when you come to the dashboard. The followers category gives you a list of people you should consider following or unfollowing. It also displays a list of your recent followers and unfollowers. Consider to Follow. Commun.it gives you a selection of people it thinks would be good to follow. It does this based on their engagement level, influence and relevance. I've been pretty impressed with the quality of the list that Commun.it provides. Consider to Unfollow. Not everyone you follow will engage with you. That's not necessarily an issue. There will be some people who don't engage with you that you are interested in. Commun.it gives a list of people it thinks you should consider unfollowing based on them not engaging with you and you not engaging with them. It's up to you what you want to do with this information, but again, it's very interesting stuff. New Followers. This gives you a list of people who have recently followed you. Although this information is readily available (either on the Twitter website or in Twitter follower emails if you have subscribed to them), it's useful to have this information here. You can zap off a welcome email to new followers very easily, by using the "Thank your New followers" function. I find this very useful, for although I'd love to thank each new member for following, I just don't have the time. The groups feature allows you to manage your community by putting them into different groups, or "segmenting your community" as commun.it put it. Examples of groups could be "clients", "interesting people", "potential clients", "bloggers". These are not too disimilar to Twitter lists, but in my view, the commun.it groups feature is so much more powerful. A nifty feature is that you can import one or all of your Twitter lists to form a commun.it group. I found this especially useful as I was able to import my "community" Twitter list that I had been managing for a while. One of these groups is called the "starred" group. You can add anyone into this group by clicking the star by their name- a great time saver. I recently wrote about ways to monitor your brand using Twitter tools. Commun.it is one of the most powerful tools out there to monitor your brand or business. You can add up to 4 items in the free version and as many as you like on any of the paid Commun.it plans. Examples of monitored items include hashtags, key phrases and links (urls) to pages on your website (or your competitors!). This is such an amazingly powerful tool and one that I use on a daily basis. It allows me to find out who has tweeted about my website so that I can thank them and engage with them, and it also allows me to monitor my hash tags and other key phases. Combine this with the reports feature (which I will come on to later) this is a killer feature! At first glance the "discover new leads" category looks very similar to the "monitor engagement" category in that you can add key phrases to monitor. What makes this different, is that Commun.it finds people for you to follow based on your key phases. It does this based on the content of people's biographies, conversations and interests. For example if you run a vegetarian cafe in Manchester you could add "vegetarian manchester" to find and engage with some potential customers who are vegetarian and are based in Manchester. The final category currently only has one feature- hidden members. If you want to hide any members so that they won't show up in any of the Commun.it lists you can click on the "hide" button in any of the lists. If you do this, they will appear under hidden members. If you make a mistake you are able to "unhide" them so that they can still appear in the Commun.it lists. Searching for Twitter members can be done very easily through the Twitter website (or any other Twitter app). Having a search facility here in Commun.it is very useful as it enables you to easily add them to a Commun.it group or quickly see their profile information and other statistics. If you are after analytics and stats then Commun.it offer you two types of reports- your activity report and engagement report. If you have a free account you can analyse the last 3 days of activity. Pro and above accounts allow you to go further back in time with the previous week and month or set your own custom dates. The activity report shows you a comparison of your activity over a set time scale (3 days, week, month, custom). This allows you to see clearly how your account is doing in terms of engagement and activity. It shows you the number of mentons, retweets and direct messages you have received as well as the number of combined mentions and retweets. You can see how many people followed and unfollowed you and compare this with the previous time period and see your follower growth. It's also useful to see how many tweets you've created and how many times you've mentioned people or retweeted. 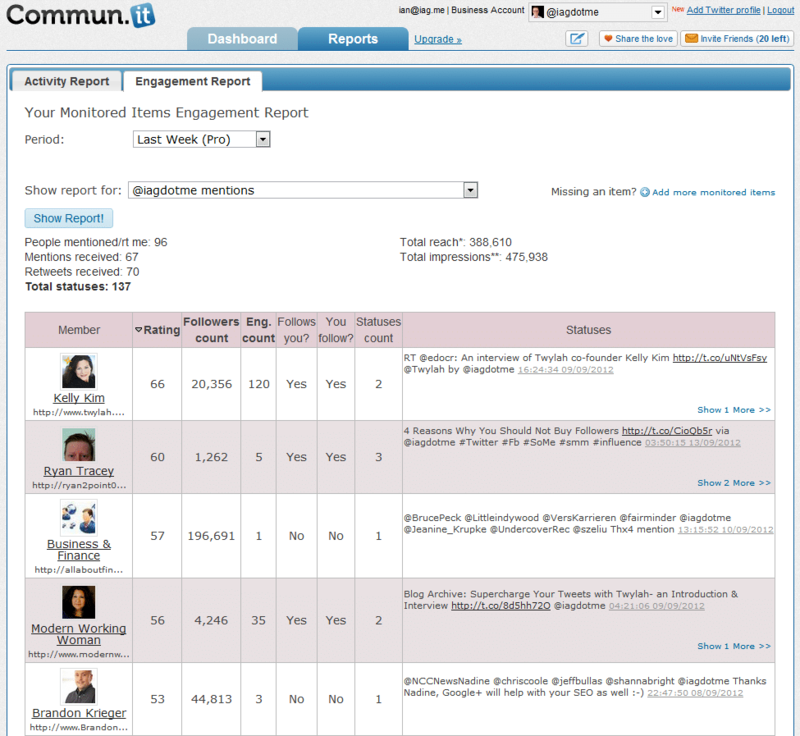 The engagement report allows you to see who has engaged with you over the specified time period. This can be people who have mentioned you or who have mentioned one of your monitored keywords or phrased. In the list it shows you their name, photo, rating score, follower count, engagement count, whether you or they follow you and the number of statuses for the particular engagement you are monitoring. One of the new additions to Commun.it is a #FF helper. If you didn't know already, #FF is a hashtag meaning "Follow Friday" and is a way of mentioning cool people that you follow to your followers. It's a way of promoting members of your core community and hopefully helping them get more followers. 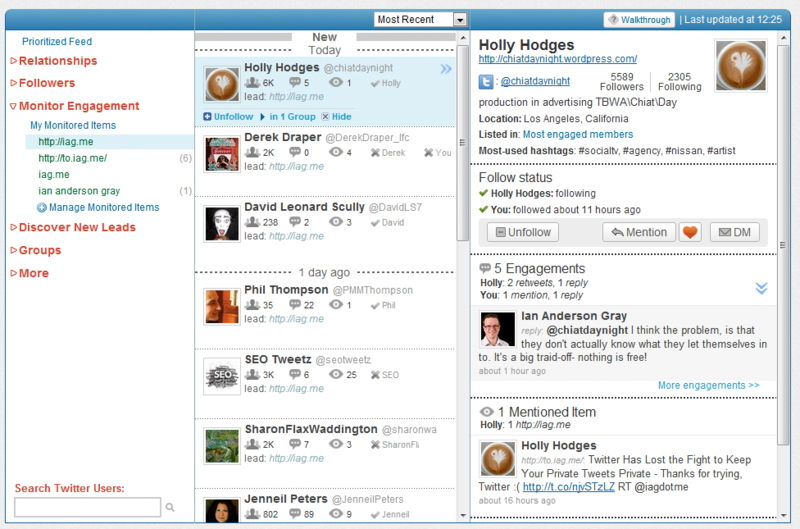 The Commun.it #FF helper pops up on Fridays to enable you to quickly send that #FF of your top community members. 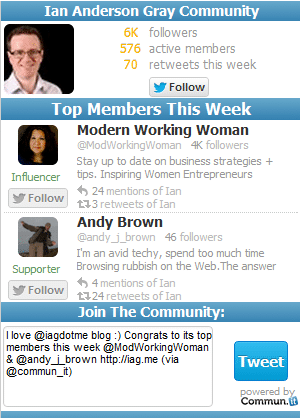 The Commun.it widget has just come out of development and allows you to show off your Twitter community on your blog. You can see a demo of the widget right here on my blog- it is at the top of the side bar. This shows your top community members and the number of active members in your community. To be honest the number of active members is far more interesting than the number of followers you have. As well as making it easy for people to follow you on Twitter, it also lets your website's visitors follow your to community members easily and also has a neat feature of sending out a tweet to connect with not only you but your top community members. To add the widget you need to click on the "Get Commun.it widget" at the top of the dashboard screen and then get the code to paste into your blog. It's very easy to do. There are 4 plans on offer which should suit most situations. Unfortunately, there is no free version any more. 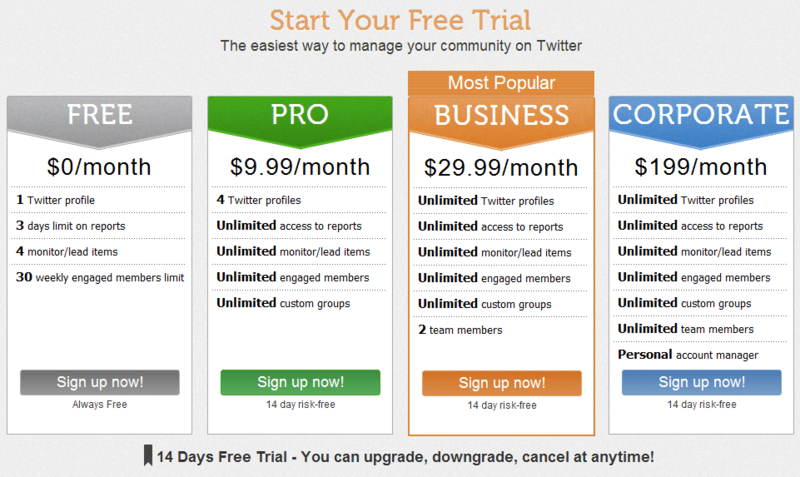 However the pro version is currently $19.99/mth which is great for individuals or any business. The pro version allows you to work with 1 Twitter account and has a limitation of a 3 day reports period, 4 monitored/lead items. It's worth saying that you can get a 14 day trial on any of the plans which should give you enough time to try it out and see how you get on with it. For most small businesses the Pro or business plans should suit. The advantage of the business and corporate plans are that apart from allowing unlimited Twitter profiles, you can invite other team members to manage one of your Twitter accounts through their Commun.it account. This is hugely powerful as you can delegate tasks amongst your social media or marketing team or allow a social media agency to manage some of your accounts. The Business allows 2 team members which should be enough for most business needs, but larger businesses may need to take the plunge and opt for the corporate plan. Whilst $119 per month may seem like a lot to some, it really isn't when you take into account most marketing budgets and when compared to other enterprise plans such as Hootsuite's which costs around $1500 per month. Being able to manage multiple Twitter accounts is really useful, as you can quickly switch between accounts to reply and engage with your communities. You can even compose a standard Tweet from each account. For further information, have a look at the Commun.it plans page. I'm so glad I took the time to work with Commun.it. It is most definitely one of the top tools I use to manage my social networks, and the only one that facilities managing community and engagement. So, what do you think? Are you convinced? Do you already use Commun.it? As always, let me know in the comments. Does anyone in this thread happen to know where commun it is based (head office) and who are the people behind it? Pity that the PRO account have been discontinued, the others are too expensive for me. I hadn’t realised that they had discontinued the pro account. Stop Saying Thank You on Social Media and Say Something Meaningful! I just started using the FREE package today. I am VERY IMPRESSED with the feature set. Unfortunately, however, it is just TOO SLOW (click option, wait MINUTES for display). Curious if this is just with FREE version? Thanks for your comment. What do you mean by too slow? Do you mean that is slow to respond and load up? Or do you mean it is slow in updating? I’ve not had any issues myself. If you have any issues, it might be best to contact Commun.it support- however I’ll get in contact with the team myself to see if they can shed any light on it. Thanks for the followup Ian! we will take a look into it, there was an hosting problem a few days ago. can you guys please confirm it’s OK now.. Excellent post and companion video Ian • Commun.it includes a nice feat/function set that fits nicely in my DiY Content Marketing system and you should know I’ve adopted this app as a core tool for all my clients. Glad I noticed your G+ Post back in January. Thanks, Neil! Glad you found it helpful- really glad you’ve adopted Commun.it for your clients. Would love to know more about your Content Marketing System- sounds interesting! I’ve found this to be a really great article! Never heard of commun.it before but I’m definitely book marking & sharing! Thanks so much- you made my day. Do let me know how you get on. It’s well worth the effort. No problem. Have you had a go with Commun.it yet? I’d love to know how you get on. Thanks for the post- pity they didn’t talk about Commun.it, but they were very good points! Thank you for telling me about this! I’ve never heard about it, I’m really going to check it out! No problem, glad you foun out about it. Will you get a pro plan? You get 30% off until tomorrow. Let me know how you get on! Thanks, hope it’s been useful. Do you use Commun.it yourself?